This episode should be nicknamed, “Meanwhile, Back at Alexandria.” While half the group has led the mega herd away from the gated community, the large number of characters who didn’t appear in the season premiere make an appearance, here. Enid reveals her backstory, Denise is introduced as the new doctor who suffers from panic attacks and Father Gabriel hopes to protect himself. Alexandria gets invaded by the Wolves, while Rick’s Gang leads away the undead parade. Carol transforms from a happy homemaker into a fearless killer, many of the background characters are killed and Carl’s hopeful girlfriend, Enid, runs away. This episode had a slow start, but really picked up the pace with lots of non-stop action. Half of Rick’s Gang quickly doubles back through the woods, responding to the loud horn in Alexandria, while the rest of the group leads the herd away from their home. Minor characters are killed, Sturgess (who?) runs away, Daryl puts Sasha and Abraham in danger, Nicholas fails as a tour guide and Glenn decides to distract the walker herd by burning down the house. Nothing goes according to plan. Many die. Nicholas kills himself. Is this the end for Glenn? Rick’s attacked and the RV dies. What’s next? Morgan’s 90-minute flashback episode begins with the character clearing the woods of walkers (and bad guys), one section at a time. Wild as a feral animal, Mad Morgan has gone walker-killing crazy and gets captured by Eastman, a forensic psychiatrist from Atlanta. Not only does Morgan awaken inside a prison, but he’s also a prisoner in his own mind, reliving his family’s turn into walkers. He’s traumatized and may suffer from PTSD until Eastman makes him face his own demons. Reaching a Zen state of mind, Morgan tells the whole tale a Wolf prisoner. For the second week in a row, a character is allowed to tell their tale before they die, which is a not-so-great trend. This was great episode, even if it was a little longer than necessary and employed a shockingly immediate change of pace, but could have easily been told chronologically and had the same effect. It will probably be nominated for an Emmy award because it was written so well, but please no more flashbacks! The story part of it was great. The tool used to tell the tale felt like it was more important than the story, taking away the momentum of the past couple of episodes. Rick returns home, Deanna is depressed, Maggie prepares to save Glenn, Spencer gets drunk and Aaron admits to losing his pack, which leads the Wolves into Alexandria. Compared to the last two incredible episodes, this is one of reflection and two smooches, but mostly it’s a downer. Way too many background characters get the spotlight here, including Bruce, Spencer and Ron. Tara is getting more dialogue than Rosita, which is criminal and Maggie reveals she’s pregnant. Oh, and camouflaged, disintegrated sewer walkers for the win! Leading the herd away from Alexandria, Daryl’s still on his bike, while Abraham and Sasha are still in their car, when they get ambushed and separated. Injured, Daryl is captured (yet again, but this time by an anonymous trio of survivors). For a tracker, he’s great at hunting animals, but people seem to constantly get the drop on him. Wade and his crew are introduced, who have been hunting for the trio. Daryl teams up with his newfound “friends,” before asking Rick’s three questions, hoping to recruit the leftovers. Escaping the hunters, Daryl’s robbed again. This time losing his motorcycle and his crossbow. It’s just not his day. After having a heart-to-heart chat with Sasha, Abraham realizes he can’t keep taking unnecessary risks. He is in heaven, though, having found beer, shelter, a RPG, multiple rockets and a box of cigars from a former Army officer. Oh, and he also tries on the undead soldier’s uniform, before putting the moves on Sasha, as well. Daryl discovers a fuel truck, teams back up with Sasha and Abraham and heads home… before receiving a call for help. This may have been my favorite episode of the group! Just as we accurately predicted, Glenn’s not dead. Although, as unlikely as it appears, 3/4 of all those walkers simply disappeared, instead of sticking around for a cornered snack. Realistically, he shouldn’t have made it out alive, especially since he only had a few splashes of blood on his arms, but not enough to hide his human scent. Who watches The Walking Dead for its realistic believability, anyway? Predictably, Enid randomly shows up, to somehow tie together the loose strands of Season 6’s storylines. She’s a loner and a rebel… and a waste of time. Hopefully, there won’t be too many stories focusing on her character. After a brief hiatus, Rick’s back and making plans to remove the walkers from the gates of Alexandria (again). Ron has gone crazy for guns and will soon have a stand-off with Carl. Morgan discusses his pacifism, Rosita teaches the art of swordplay, Spencer attempts to audition for Cirque du Soleil, Doc Denise gets involved with the injured Wolf, Carol continues to be nosy, Glenn gives a signal and the church’s lookout tower topples, bringing down the protective fence, with it. With the fence collapsing, is this the end for Alexandria? Everyone heads for cover as pandemonium reins and walkers fill the streets. Sam has blocked everything bad out of his head, off in his own little world. Carol doesn’t trust Morgan one bit and may have suffered a concussion, Denise has an extended stay with the lone Wolf, Deanna was bitten but still has developing plans, Ron reveals his attack plan and Carl covers for him, Rosita thinks that Abraham is dead (emotionally, he may be to her) and Rick’s Gang covers themselves in guts while trying to get to the armory. Morgan bodyslams Carol onto the concrete floor, the lone Wolf escapes with Denise as his human shield, Glenn and Enid peek over the wall as Sam fouls up the plans and a motorcycle gang hijacks the fuel truck. No major deaths are shown onscreen, but Deanna is as good as gone. So far, this season feels like it’s been going in multiple directions. Where to begin? The cliffhanger of Glenn’s death felt like a cheap trick, hoping to create a buzz for the midseason finale, which somewhat fizzled. Not much really happened in it. There were no true cliffhangers, the biggest event happening was the wall falling and there were no major deaths (although one is presumed). Introducing Negans’ crew, The Saviors, was a big-time development, though. The illusion of Alexandria’s safety seems to have finally disappeared. Sadly, many characters of the ensemble don’t get enough of the spotlight during the group dynamic (and sometimes not even then!). They only seem to get a sliver of the main storyline when they’re separated, on solo journeys. That seems like spotty screenwriting, to say the least. Seeing an episode from a walker’s blurry point of view was a great new innovation and using a wild turtle for a raw, chewy snack felt fresh. Carl seems to have finally outgrown his father’s hat, even though he keeps wearing bigger ones. As a teenager, he looks ridiculous wearing it. Sadly, two teenagers feel like storyline scraps: Ron Anderson feels like an unnecessary character (or is it just Austin Abrams overacting?) and Enid is simply annoying. Hopefully, Negan will make his presence felt very soon, adding a new threat and level of violence to the Zombie Apocalypse. There can never seemingly be enough bad guys on the show, since the walkers steal so much of the antagonists’ presence. But most importantly of all: No more flashbacks! 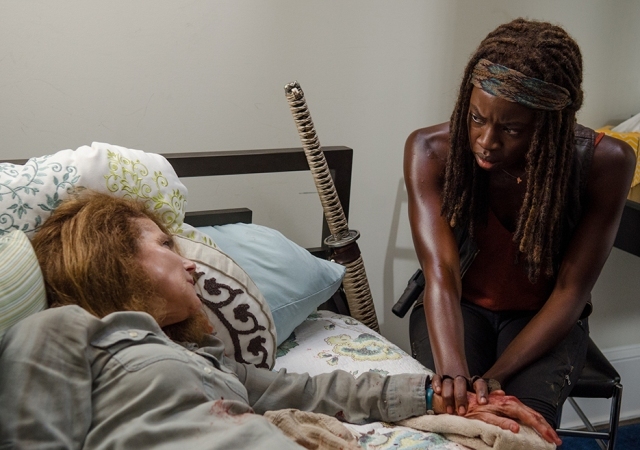 Strength: We’re working our way toward Negan’s ruthlessness. Weakness: The storyline seems to be heading into too many simultaneous directions. WTF Moment: What’s up with all these characters’ obsession over Rick’s beard?